The stability of microbial genomes and gene pools is constantly challenged by horisontal gene transfer and recombination, as well as DNA damage. Mechanisms for rapid genome variation, adaptation and maintenance are a necessity to ensure microbial fitness and survival in rapidly changing environments. Understanding microbial pathogenesis, horizontal gene transfer and DNA repair mechanisms requires an interdisciplinary approach of molecular biology, genomics and bacterial physiology. Studies on transformation and components providing genome maintenance in genetic model bacteria are most important for understanding the balance between cellular fitness for survival and disease development. In particular, we are focusing on the identification of DNA binding components contributing to the neisserial transformation system, which we suggest is coupled to pilus retraction. We are also elucidating the effect of defects in DNA repair on microbial fitness and virulence in animal models. At present the group addressing these challenges in molecular and cellular biology and medicine includes ten people and has strong international networks. 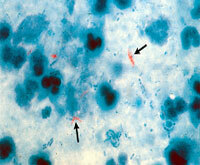 Neisseria meningitidis, the meningococcus, is the causative agent of meningitis. Pili are the primary virulence factor of this exclusive human pathogen. The transport of these macromolecular structures across membranes is performed by a complex machinery homologous to Type II secretion systems. We are characterising the structure-function relationship and interactions of the components involved in this membrane transport. 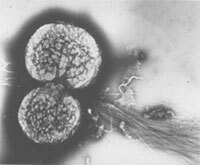 The genome of the meningococcus, is very unstable. To counteract this high genome instability, there is a need for well-developed DNA repair mechanisms. Our studies on genome instability and components providing genome maintenance in the meningococcal model bacterium are most important for understanding the balance between fitness for survival and disease development (Nature Microbiol. Rev. 2006). Mycobacterium tuberculosis is the cause of tuberculosis. Inside the hostile environment of the macrophage phagolysozome, M. tuberculosis faces unusually harsh challenges. We are studying the mechanisms for genome maintenance and thereby fitness for survival in the worlds biggest bacterial killer. Our analysis of surface structures and genome maintenance components and their actions and interactions will provide new insight into bacterial pathogenesis and virulence. In the long run this information will enable us to develop new strategies for prevention and treatment of disease.